The cause of death was heart attack. Funeral arrangements were yet to be announced by mid-day of January 11. George Garanian (born August 15, 1934, Moscow) was one of the first Russian musicians who attracted attention of Western world as part of the "jazz from USSR". He belongs to the first generation of Russian jazzmen who started to perform after the World War II. As a musician (alto saxophone), conductor and composer he always was among the best Russian musicians. He was the leader of country's best big bands: "Melodia" (70s - 80s), Moscow big band - 1992-95. Now he leads the Municipal big band of Krasnodar City (Southern Russia). This orchestra, supported by the government of Krasnodar District, Southern Russia, performs nationwide. Garanian recorded more music than any other jazz musician in Russia, performed at many international jazz festivals (Finland, India, Indonesia, Cuba etc. ), toured Germany, USA, Japan, Australia, Sweden, France and many other countries. 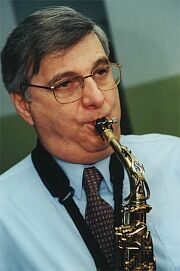 Frederick Starr wrote in his book about Russian jazz that Garanian is one of the best jazz musicians in Russia. Starr quoted famous American critic John Hammond, who heard George at the jazz festival in Prague(Chechoslovakia) - "George Garanian is phaenomenal". And person number one in jazz, Willis Conover, the host of "Voice of America" jazz program, invited him many times to participate at International jazz festivals in Hungary, Yugoslavia and other countries. At the present time George Garanian is one of the most "sought after" musicians in Russia. He is the only jazz performer who granted the privilege to perform 4 concerts annually at Moscow Conservatory Great Hall (the most renowned classical venue in East Europe). Latest work of Garanian : in summer 1999, he conducted Russian symphony orchestra for one-week recording session at Moscow Radio House with famous US jazz group Oregon. Oregon recorded their new album (released in early 2000, entitled "Oregon In Moscow"), kind of a mixture of contemporary jazz and symphony music. Steven Rodby (Pat Metheny Group) was the producer. A photo report from those sessions you may find in our online magazine Jazz Complete, #25-99.